The new hotness in gaming and technology in general, Virtual Reality headsets are sweeping their way through the industry, with some big names bringing their versions of Reality to the forefront. Plus, our Deputy Editor looks a berk in the headsets, which is always good for a laugh. 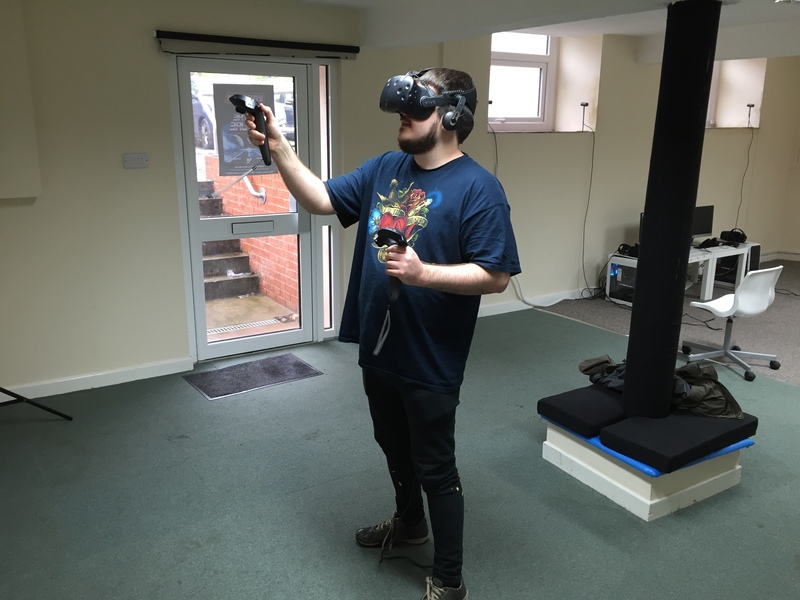 We Are Chester’s Deputy Editor has been the little sleuth this past week, as he had a go at some new Virtual Reality gaming headsets in a company in Wrexham. Did he have a good time? Was he swept up in the Matrix along the way? We can safely say ‘yes’ to one of those questions. On Saturday 4th November, all-around ace guy and Virtual Reality [VR]-guru Ed Booth welcomed me into what could easily be the best man cave ever imagined. Or, into the avid gamer’s paradise. Or even a budding adventurer’s practice room. Depending on your tastes, what Ed’s company Vorteka VR has on offer is as diverse as you want it to be. Virtual Reality (VR) is the latest video game trend that is slowly (but surely) sweeping through the industry. You’ve probably seen or heard about some of them over the past few years. Chances are, you know somebody who has one or is getting one. Heck, you may even have one yourself! Regardless of where you stand in regards to ownership, VR is on the increase in terms of popularity, and, most importantly, potential. As more people get into the possibilities, the better the systems will become. Better devices; better experiences – though, that’s not to say that what is already out there isn’t thrilling as it is. Allow me to set the scene for you; you don a futuristic visor, adjust it to suit your needs, grab a pair of handsets or a controller (where applicable) and within a matter of moments you can find yourself submerged beneath the Atlantic Ocean as a Blue Whale swims past with an inquisitive eye. Next, you’re sat in a corridor, ambiguous enough as it is until something appears from around the corner at the end of the room; a hulking great big Tyrannosaurus Rex! He’s stomping through the hallway, getting closer and closer to you. His muscles tense and flex as he walks. His eyes blink. And his saliva is jettisoned towards you as he roars directly in your face. From here, you could find yourself standing on a skyscraper in a sprawling city, with a 500-foot drop beneath you. You peer down over the ledge, and the vertigo feels real. Of course, there’s never any real danger, but your sense of perception is thrown to the wind as you think that at any one moment, this could be it. That’s a mere taste as to what VR can offer you, and it’s only a fraction of what you can find on offer in Wrexham’s Vorteka VR. If you’ve been thinking about taking the plunge (or at the very least, trying out) a VR-headset, but don’t know where to start, then Vorteka is a great place to experience the thrill. There are no fewer than six headsets to choose from (including industry leaders Oculus Rift and HTC Vive), with each one offering different levels of immersive entertainment. Primarily set-up in Wrexham (less than a minute’s walk out of Island Green, besides the old Mitre Vaults pub and underneath Wrexham & Prestige Taxi), Ed can and will cater to any size venue from a kid’s party, to a care home, to even a wedding – if that’s what you fancy on your big day, you have my utmost respect! Though, it’s probably not the best idea to have a go when you’ve been on the drink all night – I was stone-cold sober and was tasked with driving home. The world just didn’t feel real anymore. Heaven knows what I’d have been like after a skinful! Vorteka can and will cater to the aforementioned venues (and more besides of course), and Ed’s taken the company all around the local area, so never shy away from asking for something closer to home. Ed has made an extremely niche market into something that the whole family can get into (and then some!). As the night’s draw in these increasingly cold nights, Vorteka’s future-ready play-rooms are a perfect place to unwind, let your inhibitions go, and have a great night out with friends, family, or co-workers. Give it a try. Once you leave, you’ll be eagerly anticipating your next visit! For more information on Vorteka VR, visit their Facebook page or visit their website. And whilst you’re at it, tell your friends, your parents, your kids – Heck, even your neighbour that you hate. You can always get them to “Face Their Fears” as clowns, bats, spiders and more jump out at them! What could be a better?